In this article, I'll show you a handy way of identifying the S_RFC authorizations your users need; this method helped me a lot recently. The authorization object S_RFC consists of three fields, but only one of them is of interest for us: RFC_NAME – which is checked against the called function module's group (the other two fields have only one possible value each, so we'll ignore them here). I opted for a heuristic approach to determine values for that field… so first we'll collect a list of function module calls that occur on a productive system. In part 2 of this series, we'll use that list to determine the affected function groups and derive the required S_RFC values from that. Using the Security Audit Log would imply some nasty problems: the log size per day is limited (parameters rsau/max_diskspace/*); all logs generated after that limitation is reached are lost. The functionality of tcode STAD on the contrary quite exactly matches what we need. Furthermore, there is no need to configure anything, as the statistics are recorded anyway (in fact the profile parameter stat/level has to be set to 1… but that's the system default). The structure which is used to record the statistics contains a field that holds the called function modules — so another benefit of the latter method is that we don't have to split a text string (like the one stored in an Audit Log message text, e.g. "Successful RFC Call RFCPING (Function Group = SYST)"). The next step is to create a new report called ZS_STAD_EXTRACT_RFC_CALLS and copy-paste this source code. Then you need to set up two new customer tables that hold the data we want to collect. Go to SE11 and create the tables ZSSTAD_RFC_DATA and ZSSTAD_LASTRUN. Then please repeat these steps for the second table. Last but not least you should schedule the report to run every hour — that's a good value because the runtime of the report stays rather short and there's no danger of losing data (the retention period for STAD data is usually 48 hours, because the statistics files are written every hour and the parameter stat/max_files determines the number of files kept – 48 per default). 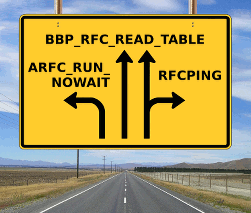 You also might want to increase the profile parameter stat/rfcrec, which determines the maximum number of RFC calls in a session that will be recorded in STAD. The default value of 5 is probably not sufficient for all cases! 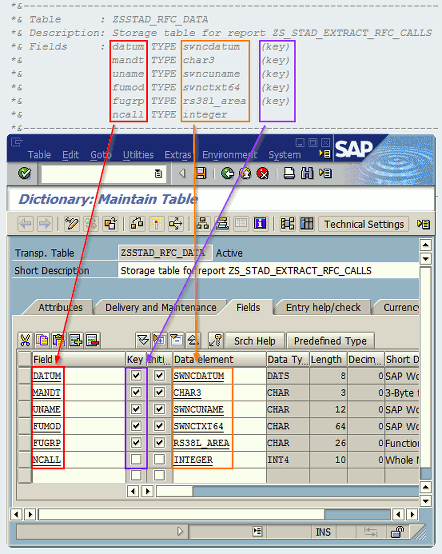 Please check SAP Note 1964997 for information on the parameters stat/rfc/distinct and stat/rfc/distinct_depth, which are also relevant. Thanks to Christian Wippermann for pointing me to this! The report reads all statistics records since the time it was last started (which is saved in table ZSSTAD_LASTRUN) or — if that table contains no values — the ones since one hour ago. The records are filtered for RFC calls (all other record types are discarded) and the called function modules' groups are determined. As the last step, this information is saved to table ZSSTAD_RFC_DATA. the number of calls (NCALL) per line. The information in this table will later be used to determine the values for S_RFC.